Enter your email address to get new posts sent to you. I was excited to bring four monarch caterpillars to our Art Room for my third graders to observe for their collaborative art project based on the monarch’s life cycle. Each class period, they got to observe the caterpillars. This was truly the most joyful part of our year! Every day they saw something new – they were so surprised by how quickly they grew. I had a couple of classes that were fascinated by the caterpillar poop. I told them they could talk about it, but they had to use the scientific word for it – fras. I created videos so that I could share interesting moments with the classes that missed them. For a few weeks, it became a wonderful ritual that we would watch the latest video during our Circle Time at the end of class. One lucky group was there when a caterpillar morphed into a chrysalis. Another class got to be there when we released one of the butterflies. After learning about Kandinsky, second graders played a drawing game using crayons. Later, they painted over their artwork with ink to create a wax resist. I am not a huge fan of crayons; it’s hard to get them to do exactly what you want them to do. But since I inherited boxes and boxes of crayons with the Art Room, I’ve been designing several projects around a technique that makes crayons interesting – wax resist. My older students love doing a wax resist project that involves covering the whole paper with crayon and then crumpling it. For my 2nd graders, I wanted to try something that would involve a little less intense coloring. I decided to inspire them with images of Kandinsky’s artwork. After they talked about his paintings, we played a drawing game inspired by Kandinsky’s abstract art. I love playing games with my students; it is such a great way to get their creative juices flowing! I think next time I might use the game as a warm up and then let them create a drawing on their own inspired by Kandinsky. I emphasized how important it was to press down hard with the crayons as they drew. What really helped them remember was a visual example that showed a “soft drawing” and a “hard drawing” side by side. It was a great reminder that once you paint over it with ink, a hard drawing will show through bright! Second graders with india ink is a scary proposition. It worked out that we were inking our artwork the week before Christmas Break – Yikes! I was so proud of how my second graders handled themselves and the art materials. We didn’t have a single spill in all 14 classes. Making a video about how to set up the table for ink was a huge part of that success. It showed them exactly what to do and the magic of videos meant that they all listened carefully! I always have a few kiddos who are absent, so I save their artwork in their class folder so that they can work on it during a Center’s Day. I had kids who were also finishing their Watercolor Grids. On a whim, I decided to have them paint over their crayon designs with watercolors. It was magical! Next time, I think it would be fun to give my students a choice of using india ink or watercolors for the background. Inspired by Vladimir Kush, fourth grade students cut out an image from a magazine and created a surreal background for it using watercolor pencils. One of my favorite art movements to teach is Surrealism. I especially enjoy introducing it to my students who are in the upper elementary – middle school grade levels. Developmentally, they are able to understand more abstract concepts. And age-wise they are all about silly non-sequiturs! I had bookmarked images of Vladimir Kush’s surreal paintings; I was intrigued by how he incorporated objects or animals into a landscape. I decided to create a collage/painting project inspired by his artwork. When I introduced the concept of Surrealism to my fourth graders, I pointed out how he had used animals as the sails of a ship or as a bridge. I explained that they were going to be choosing an image to use as a part of a landscape or cityscape. I gave them tips on how to carefully cut it out so that the details showed. Being a stickler on the craftsmanship aspect of this step made a big difference in the impact of how their artwork looked when they glued down their image. The hardest part of managing this project was helping the kids keep up with their magazine image as they were sketching, coloring and painting the background. Gluing down the image was the very last step, but cutting it out had to be the first step. I spent a lot of time reminding kids to put their images in their table folders where they would be safe! After they cut out their image, they traced it’s outline on their paper so that they could see where they were going to glue it down. Then they sketched a surreal background that involved their image. This step was tricky for some of my students. I spent a lot of that class period walking around and brainstorming with them. Next time, I think I’ll have them do a quick brainstorm with their tables before we even pass out the paper. Coloring the background took a solid day and a half for most of my students. This was one of those projects where I had students finishing at vastly different rates. I went ahead and played the video about painting the watercolor pencil background as soon as the first student was ready to move on to that step – even though there were students who hadn’t started coloring their background. I also designed a drawing project that tied into Surrealism that they could easily transition to if they finished their painting early. In the past, I’ve noticed that the biggest issue kids run into with watercolor pencils is not realizing that you have to wash your brush in between colors. So, in my video I showed them what not to do. I painted all over a section of my example, smearing together 6 or 7 colors into one big, muddy mess. It was funny to hear their gasps of astonishment! And it was the first year I didn’t have any heartbroken artists who had painted over several different colors. This was one of those projects that was a little overwhelming to tackle for the first time. It had so many different aspects that had to all come together in each student’s head. (Which I’m realizing is difficult to do when you see them once every six days!) Now that I’ve tried it out, I’m excited to fine-tune it for my next group of students. After discussing a painting by Jasper Johns, second graders drew a grid using crayon and filled each square with a letter of their name. Then, they painted over their drawing with watercolors. I love the first painting project I do with second graders! They are ecstatic when I start our class by saying, “Today we are going to begin our watercolor project.” This year, I decided to do a lesson that used watercolors along with crayons. When I saw Kristin Thomas’s post about a Jasper Johns-inspired project on her blog For the Love of Art, I knew I wanted to try it out. After they observed Jasper John’s artwork that used a grid filled with letters, I showed them a video about how to draw their own grid and trace over it with crayons. At first, I was worried that splitting this project into 2 days would leave us with too much extra time. It ended up being perfectly timed. We definitely need a whole class period to draw the grid and fill it with letters. After the video, I reviewed the steps to drawing the horizontal and vertical lines for their grid (with hand motions, of course!) Those few extra minutes made a huge difference with helping them remember how to use their ruler. I toyed with the idea of adding measuring into the mix, but I’m glad I didn’t. Just using the ruler as a straight edge was a lot for them to process. I made sure to tell them that their squares didn’t have to match. In fact, it would make their artwork even more interesting if they didn’t! I also emphasized in the video and during class that they had to press down hard with the crayon. If they didn’t, the letters wouldn’t show through the paint. In my example, I used the letters of my name to fill the grid. I let the kids decide if they wanted to do their name, another word or just random letters. Most kids decided to use their name. I think next year it might be fun to use adjectives that describe them. Painting day was so much fun! In the video demonstration, I focused on just the basics of how to use watercolors. It was exciting to watch all of the different experimental directions that the kids went with their artwork. Some kids experimented with letting colors bleed together. Other kids tried out mixing more than one color in a square. Overall, this one of my favorite painting projects that I’ve done with second grade. It was the perfect balance of structured and loose. And it was an amazing introduction to the magical world of watercolors! After cutting and gluing organic and geometric shapes, elementary art students use warm or cool colored markers to fill the background of their artwork with lines. I really enjoyed starting the year with this project! It was the perfect balance of structure and freedom. I was inspired by a lesson I saw on Art Tango and decided to make it appropriate for my third graders by allowing them to make more of the artistic decisions. I tried to step back during the first day while they were cutting out and gluing down shapes. I wanted them to have the creative freedom to make different choices than the steps they saw in the demonstration video. I wanted them to have the creative freedom to make different choices than the steps they saw in the demonstration video. I let them decide how big or small they wanted their shapes to be. I didn’t put any limitations on how many shapes they needed to have or if their shapes could overlap. During the first day of this project, our room had that pleasant buzz of kids working! I overheard so many great conversations as they brainstormed with each other about their art. On the second day, I had some kids that jumped right in to drawing lines to fill their background. There were other students who needed a little more direction one on one. I told them to start out by drawing an outline around each shape three times. After that, I showed them how to fill in the new spaces their outline had created. In the demonstration video and during class, I made sure they knew that they could be creative and come up with their own way of using lines to fill the back ground. It was so much fun to see how unique everyone’s artwork was! This was a great project to set the tone for how the art room operates. Students had a chance to see that they have the creative freedom to make different choices about their art. The project also had enough structure that they were able to learn the art room procedures and expectations. Wax resists are a great way to end the quarter! 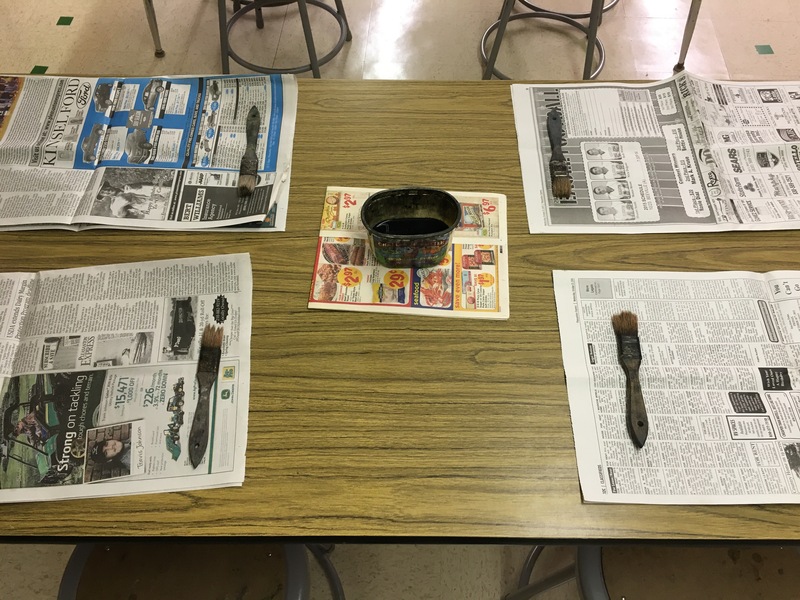 Each student created an abstract or realistic drawing, colored a thick waxy layer with crayon, crumpled it and painted it with india ink. Every teacher develops a toolkit of lessons that get kids through those last few weeks of school before a big vacation. With summer break inching towards us, I knew I needed to unleash one of my special projects to keep my third graders excited about their artwork. What I love about wax resist is that the process is oddly calming – coloring a thick waxy layer of crayon is a good way to work out some frustration! Coloring a thick waxy layer of crayon is a good way to work out some frustration! I let them know that their design needs to be big and bold because small details will be lost once you crumple and paint the paper with ink. But other than that, they are free create any idea they like! It’s a project that kids can easily choose their own subject for. The majority of my students decided to create abstract designs. When we use 9″ x 12″ paper the coloring takes awhile, usually two solid days. At the end of the second day I might have a kid that is ready to ink. This year, I used 9″ x 9″ paper instead. Most kids were able to finish coloring during the first class and then ink during the second. I was excited that there was a way to make this a two day project! Crumpling the paper is so much fun for the kids! I make sure to tell them about that step before we even start sketching, so that they don’t feel surprised or sad when I ask them to crumple their artwork. I show them how to open and crumple several times to get cracks in the wax. We talk about how the ink will soak into those cracks, but the wax on the rest of the paper will resist the ink. My demonstration for inking is a little dramatic. I make a very big deal about how india ink is permanent. I tell them that even if they aren’t inking, they need to walk around the room calmly and carefully during this project. You never know who might be behind you with artwork covered in ink! It is essential that they wipe off all the ink from their paper before they walk it to the drying rack. Cleaning up india ink trails from the floor is no fun! Getting a good coat of ink without over-doing it can be tricky for a lot of kids. Not enough ink means the cracks don’t show up. But too much ink can mean that their paper tears when they pick it up. I’ve started telling them to “scrub” the ink into the paper with their bristle brush. I also have to remind them to paint all the way to the edges – that’s what the newspaper is for! I’ve started telling them to “scrub” the ink into the paper with their bristle brush. The results from this project are stunning! Most quarters, we were working on this project when the Showcase was already hung up. I definitely was tempted to mat their wax resist projects and hang them up in between classes! I’ve thought about re-structuring the order of my projects, but the wax resist is such a perfect way to keep my 3rd graders engaged before a big transition that I think I’ll keep it right where it is. Third grade art students “painted” a background with bleeding tissue paper, then created creatures using lines and shapes from Miro paintings. I like to ease my third graders into painting, and bleeding tissue paper is perfect for that. It’s all the excitement of painting with about half the mess. On the first day, they observe two paintings by Miro and draw three shapes that they see. Then I demonstrate how to use the bleeding tissue paper to create a background. I keep the steps posted on the board, so they can remind themselves. First, they have to spray the whole paper with water. Then, they overlap the tissue paper squares so that they cover the page completely. Next, they spray the paper again so that every square sticks down all the way. I make a big deal about the last step – which is to use a paper towel to soak up any puddles on their paper before they bring it over to the drying rack. After the demo, I really ham it up and have the kids repeat the “Spray Bottle Pledge.” It is incredible how much silliness (and messiness) it prevents in the long run! I let the poster board dry overnight with the tissue paper still on it. In the morning I take them out and throw away all of the tissue scraps. (Which sounds like a lot of work, but it’s actually fun – a little dose of colorful confetti to start my day!) The kids are usually excited by the results; I learned that I have to prep them the first day by showing them an example of how the background might turn out, so they aren’t frustrated by the whites spaces. If a student is disappointed, I tell them that it looks like tie-dye and that the white helps the colors to pop out. On the second day, I keep the image of the paintings on the board and I pass out a sheet that has some of the shape and line combinations from the paintings. I talk them through an example of how you could make a creature by putting together some of the shapes. I think aloud about which shapes I could use as the head, the eyes, the body. This also gives me chance to explain that they can change the size and direction of the shapes. And they can use the same shape more than once. They have free reign to use other shapes they observe in the painting that I might not have put on the hand out. They can also choose if they want to make one, big creature that fills the whole page or if they want to draw a lot of smaller creatures. For most kids, they are able to sketch their creature in pencil, trace it with Sharpie and erase the pencil marks during that second class period. If they finish before class is over, I let them free draw in their sketchbook. Then during the third day of the project, I introduce the “Roll a Miro” game, which keeps them engaged in their sketchbook for the whole class. This project had definitely become one of my favorites. The kids really enjoy making it and it’s a great way to get them thinking creatively. I like that it scaffolds them into more abstract art-making. They aren’t just copying one of Miro’s paintings, but being inspired by his shapes gives them some building blocks to start with.